Located on a hill in the highest corner of a village amid an agricultural area in Northeast Bulgaria. 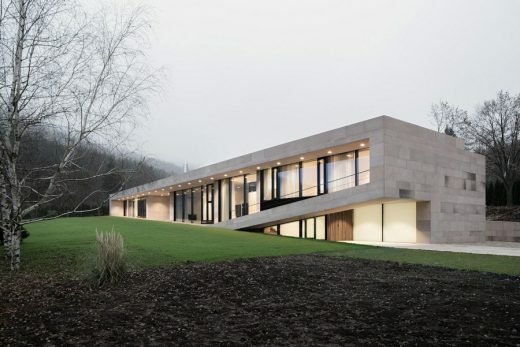 The site of the project is distinguished both by its panoramic views and distant visibility. The new building is on the boundary between two periods and between the city and nature. 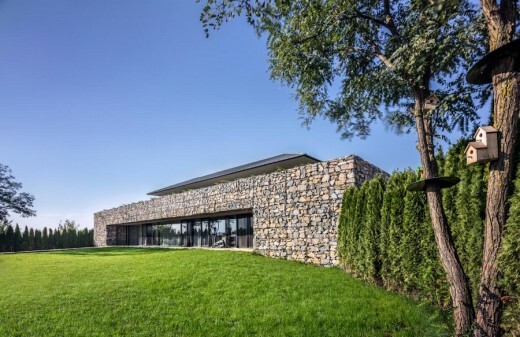 It completes the complex, gives it a new face and stares at the iconic view of Vitosha Mountain. The plan outline visualizes the planning regulations’ limitations and maximizes the building area, but at the same time gains dynamics from the shape of the plot. The plan is organized between the two solid walls, the veranda, the intermediate space of the stair and the small courtyard/opening in the centre. A suspended hand-woven wooden sticks wattle unifies the external and the internal spaces, serving both as cladding on the blind walls and shading in front of the glazing. Architect studio based in Bulgaria.